Flash forward 50 years, and humankind is still learning from these landmark missions, using the data gathered from the Moon and the instruments deployed there to plan our next grand endeavor: Orion, which will travel to the Moon, to Mars and beyond. For years we have mapped the Moon for future landing sites using missions like Lunar Prospector (1998) and the Lunar Reconnaissance Orbiter, or LRO. LRO has also preformed dozens of other experiments over its lifetime that will help NASA put humans back on Earth’s large, gray-speckled satellite. The crew aboard Apollo 8 got the first close up view in history (67.4 nautical miles [108.5 kilometers] on nearest approach) of the lunar surface and took the highest quality photos available at the time. We have come a long way since then, building on our database of knowledge through new missions and revisiting old data from these original pioneers. Though the Moon may be a beautiful object at which to gaze, it also holds secrets of Earth’s development, as well as that of our solar system. Earth’s atmosphere protects us from all manner of dangerous radiation, meteorites and other debris from space. The Moon does not have this buffer, and is instead directly affected by objects in deep space acting on its bare surface. As NASA turns its attention to putting human explorers on the Moon once again, both new and old data will be used to choose landing sites and to decide what new instruments the next generation of astronauts should carry with them. 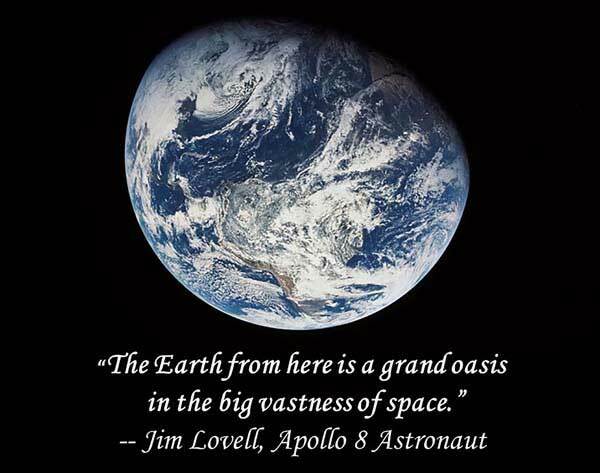 Apollo 8 and later missions could not make observations about the Moon’s space environment or complex geology, a gap that LRO and missions like Clementine, LADEE, GRAIL, ARTEMIS and M3 have been able to fill. The Moon is our nearest neighbor and therefore the first stepping stone to deep space exploration. Scientists are studying our Earth-Moon system to better understand our home. But they also want to know how unique our situation is. Are there other systems like ours out there somewhere? Is a Moon somehow essential to the successful development of life on its parent planet? How could we learn to survive without a protective atmosphere like Earth’s?